For years, Bob Hopkins has shared his thoughts and wisdom with us through the Publisher’s Letter of this magazine. Now that he has retired from the magazine to devote his time to the PAVE program (Philanthropy and Volunteerism in Education), it is our turn to share our thoughts about Bob. When you look up the word “philanthropy” in the dictionary, there’s a good chance you’ll find Bob Hopkins’ picture. Bob has been relentless in his mission to communicate to friends, colleagues, and innocent bystanders that it is their moral obligation to give spiritually, financially, and/or through volunteering. And he walks the talk himself because he believes that when it comes to the love of mankind, the definition of philanthropy, there can be no exceptions. 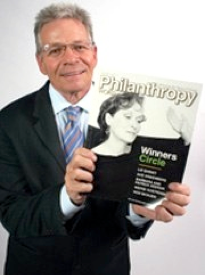 Many people know Bob as the founder of Philanthropy World. Since 1996, he highlighted the goodness of hundreds of remarkable people and organizations in its pages. He has shown appreciation to so many who would have otherwise gone unrecognized for their generous contributions to their communities, inspiring them to do even more than they ever imagined. Bob has a remarkable ability to connect people to one another. His creativity, energy, and positive attitude brought bold ideas to reality in the pages of this magazine and, now, the PAVE program. Through the magazine, he has showcased the generous philanthropic work of so many people, but his greatest legacy will prove to be the PAVE program, because it teaches the concepts of giving while helping young people develop social and leadership skills that will serve them throughout their lives. The philanthropic community has greatly benefited from Bob’s vision, and we have all greatly benefited from his friendship. We wish Bob the best as he moves on to his next challenge, but we know that whatever path Bob Hopkins chooses to follow, it will always be one that is rewarding and enriching to others.